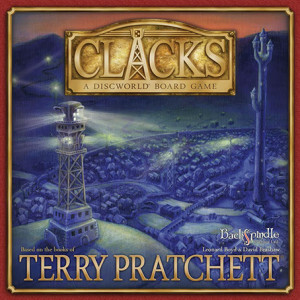 CLACKS – a Discworld Puzzle Game based on the semaphore messaging system featured in Sir Terry Pratchett’s Novel ‘Going Postal’. 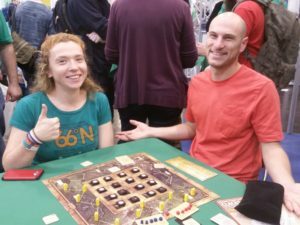 The game was officially released at the 2015 Irish Discworld Convention. 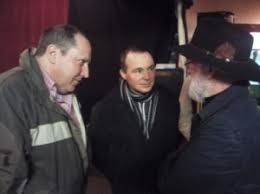 The Fastest (non-magical) Messaging System on the Discworld. Using a semaphore system of shuttered lamps on top of high towers, the Grand Trunk Semaphore Company has revolutionised long distance communications on the Discworld. Their network of Clacks towers covers most of the Unnamed Continent, but now the old postal service is fighting back. Driven by the determination of newly ‘volunteered’ Post Master ‘Moist Von Lipwig’ the Ankh-Morpork Post Office has challenged the Clacks operators to a race from Ankh-Morpork to Genua. 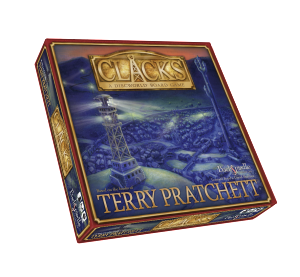 First of all play against your friends and claim the title of Fastest Clacks Operator on the line, or in contrast, play ‘together as a team’ to win the race across the Discworld and prove that Clacks is here to stay. As Sir Terry believed in us, for that reason we can of course, have the game designers, Leonard & David sign each game before it is shipped to you.